1. THE CLUB will reach the 2012 NBA Playoffs. 2. THE CLUB will have a player participate in the 2012 NBA All-Star Game in Orlando. 3. THE CLUB will win 25 or more home games at Oracle Arena. 4. 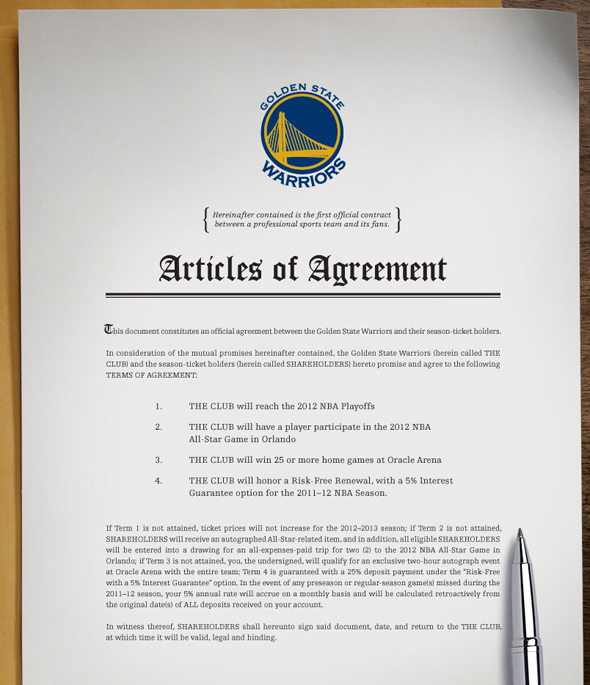 THE CLUB will honor a Risk-Free Renewal, with a 5% Interest Guarantee Option for the 2011-12 NBA season. Now if only the Warriors could draw up a contract guaranteeing that the Heat would never win another game…that would be impressive.